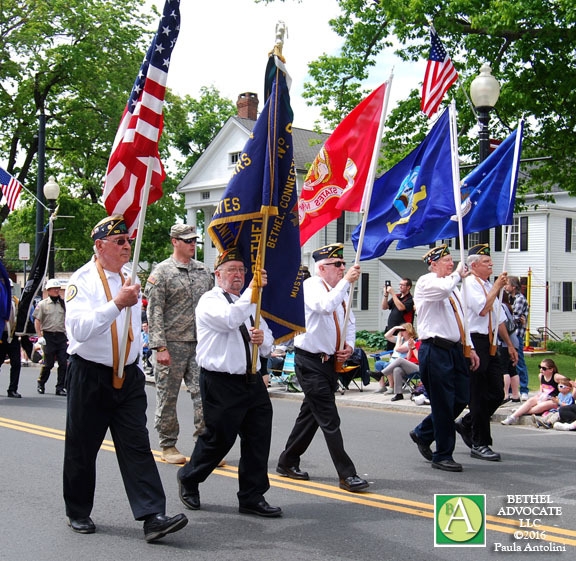 American Legion Post 100 members march in Bethel Memorial Day Parade, May 29, 2016. OPINION / LETTER TO THE EDITOR / Written by Donald Borsch Jr.
As I was sitting there, at my local American Legion meeting, and I was looking around the room at the Veterans gathered there, it dawned on me: I’m 50 years old, and I’m the youngest man in this room. My mind raced in tandem with the quickened pace of my heart. It was a terrifying series of thoughts. It is a brutal truth that we are steadily losing our World War II Veterans, both men and women. It is a brutal truth that we are beginning to lose our Korean War Veterans, as well. These service members are in their 80’s and 90’s. Time marches on, and is no respecter of mankind, despite mankind’s sacrifices to the greater good of military service. Then we come to our Viet Nam Veterans. This is a generation of soldiers, seamen, Marines, and airmen that had to endure public scorn and vitriol when they returned home to our United States, due to a poisoned and shifitng American sub-culture of disrespectful and rebellious twenty-somethings. How incredibly frustrating and difficult it must have been to serve then. The majority of our Veterans from this era are now in their mid to late 70’s. Many of them have fallen sick from repeated exposure to Agent Orange, manifested in their aged bodies in the form of myriad ills and unexplainable maladies. Such a gross injustice. For myself, I view every previous generation of Veterans as my fathers and mothers. They walked in the steps of those who came before them, and then it was my turn to walk in their footprints. Ours is a generational existence, this Family of Veterans, with each new generation paying respect and homage to the previous. It is fitting. It is how it should be. And it is never demanded, but it is freely given and offered. We are losing our military heroes, both men and women. With each passing year, the number of Veterans dwindles just that much more. In losing our heroes of past military service, we are also losing pieces of our history as a Nation. It is imperative that as Americans here in Bethel, living under the umbrella of freedom that so many others before us sacrificed for, we never allow such history to fade into obscurity. These days, we have a new generation of Veterans, being those who have served in our Armed Forces for Desert Storm, and those who have served in this post-911 world we live in. The times they are a changing, but the mission is always the same: protect and defend freedom. For this reason I am extending an informal invitation to all Veterans of military service to consider visiting our local American Legion Post 100. We would gladly welcome and receive you, even if to simply linger about and share stories of your experiences in our Armed Forces. Please know that all Veterans are considered as family here. And while it is true that we disagree at times, we are bound together by our Oath of Service, and that particular Oath covers a lot of ground between us. We officially gather each second Tuesday of the month, at our conveniently located Legion Post, over 7 Elizabeth St. Our number is 203-748-9400. Please consider visiting us in the near future. YOU ARE ELIGIBLE TO JOIN THE AMERICAN LEGION. Fill it out and return it to any Post 100 member or mail it to the Post at P.O. Box 100, Bethel, CT 06801.